Years ago when I moved to California from New York one of the first things I did was look up the local independent publishing group. These local groups are scattered all over the country. Run by volunteers and powered by optimism, they are great gathering places for authors and people associated with the book trade. I knew there was no better way to get up to speed with what was happening in the area. I also hoped to find some clients for my new book design business, Marin Bookworks. I went off once a month to a room in a temporary building behind one of the local high schools, and listened to guest speakers talk about promotion, book distribution and all the other things that concern small publishers. This was before the internet was as powerful as it is now at connecting people to information, and to other people. We relied on these personal connections for our networking instead. And it worked. I also enjoyed going to the annual big publishing bash each year, Book Expo America (BEA) but the little local publishing meetings were far more practical. But recently I found out about another publishing conference, one with a difference. This one has all the educational courses, indie publishing experts and chances for networking you find at conferences. The big difference? It’s online. That’s right, you don’t have to go anywhere. You don’t have to book a flight, arrange a hotel, get a dog sitter, or rent out your house. It’s call the Self-Publishing Online Conference, and it’s run by Susan Daffron and James Byrd of Logical Expressions Publishing. Susan is the author of 10 self-published books, and contributed a popular post here on TheBookDesigner (The Holy Grail of Book Design). I think this online conference is a terrific idea. Speakers include Dan Poynter, Rick Frishman, Penny Sansevieri, Roger C. Parker, Mark Coker, Joshua Tallent and ten more experts (yes, I’m speaking on book design, and pretty excited about it). I understand there’s a lot of interaction at the event. Did I mention this is the 3rd anniversary of the Conference? The Conference is in pre-sale mode right now, so there’s a big bonus for registering before May 1: you’ll save $50. Not only that, Susan has given me a special Book Designer Coupon Code just for readers. If you use this code on the registration form, you’ll automatically save another 10% off the fee. With these two discounts, you’ll pay the special price of $87.30. After May 1, it’s going to cost $147, and I noticed that the recordings of last year’s conference are now selling for $249. So this really is a good deal. (These prices are for a Standard pass, there’s also a Premium version you can find out about on the SPOC website. Did I mention the Conference runs for three days, from May 10 through the 12th? I should have. 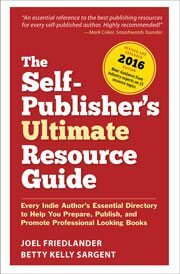 Did I mention Susan Daffron is going to sit down with me for an exclusive interview on the Self-Publisher’s Online Conference? I should have. Watch for it in the immediate future, as I ask her exactly how this conference will help self-publishers get into print. Thanks, Kate. I’ve corrected the link. Would this be appropriate for fiction books, or will the focus be on non-fiction? Many of the speakers do work with non-fiction. (For example, all of my books are non-fiction.) With that said, many of the sessions are applicable to either fiction or non-fiction authors. For example, Joel’s session on book design will be relevant to fiction just as much as non-fiction. Plus, we have sessions on ebooks, which are extremely relevant to fiction writers today. Past attendees have been fiction authors and told us they enjoyed the event and got a lot out of it, particularly related to the book publishing and marketing stuff. Right now, my husband (and SPOC co-organizer) James Byrd is working on a fiction book, so he is *really* dialed into the fiction world right now. Because of the self-publishing success of writers like Amanda Hocking, a lot more people are considering self-publishing a viable choice for fiction, so we’re doing our best to address that at SPOC this year. I agree with Susan. Looking at the speakers and subjects, fiction writers will get a lot out of the conference as far as producing and marketing their books. Also, it looks like fun! This sounds like fun and an opportunity to fill in all the little holes and pieces that come up in self publishing. Sounds great – so I can attend in my pyjamas. Thanks, Susan. This is great! In addition to the live calls, we’re also including some bonus recordings, so its a total of 15 audios. The only thing that isn’t recorded is the Q&A roundtables, so people can feel free to ask any questions they like. Joel, the Self Publisher’s Online Conference sounds fantastic. Thanks for the coupon! Are we absolutely sure that it will be recorded, in case we can’t attend all the events live? Thanks again for this, and for your ongling Blog Buffet! It sounds like fun, doesn’t it? And your feet don’t get tired!